If you own a KitchenAid stand mixer, then you know how indispensable it can be. It whips egg whites, mixes batter, and kneads dough. And with the food grinder attachment, it can do even more, from grinding meat, fruits, and vegetables, to bread and hard cheeses. It actually has a number of attachments and accessories of its own, making your KitchenAid stand mixer even more versatile than it already is. The food grinder attachment turns your stand mixer into a meat, cheese, bread, and vegetable and fruit grinder, utilizing the motor of the mixer to do the work. The coarse and fine grating plates allow for flexibility, making it simple to create a homemade salsa, fresh breadcrumbs, burger patties, and a variety of dips. The white, plastic mechanism attaches to the power hub on the front of the stand mixer. Along with the housing, the food grinder includes the fine- and the coarse-sized plates, auger, knife, securing ring, and the stomper/wrench. The grinder body, ring, and food pusher are dishwasher safe. The metal blade and grinder plates require hand-washing. The grinder is also expandable with a separate fruit and vegetable strainer accessory (sold separately) that lets you make things like applesauce, baby food, jams, and chutneys. If you would like to make your own sausage, you can use the food grinder along with the sausage stuffer kit, which is also sold separately. If you already own a stand mixer, and you have the need for a piece of equipment that will grind food, the KitchenAid food grinder attachment is a good buy. It is cheaper than buying a standalone grinder, is easy to use, and somewhat simple to clean. It grinds 2 1/2 pounds of meat in 10 minutes and is expandable with various separate attachments and accessories. One negative is that the body is made of plastic, which is sturdy enough but won't last forever. The food grinder attachment also requires a KitchenAid stand mixer, so if you don't own one, you cannot use this piece of equipment. If you're looking for a tool with basic food grinding capabilities, but you don't have a KitchenAid mixer already, you should not run out and buy one just to use the food grinder. Then again, it's almost unimaginable that someone who's into food, likes to cook, and wants to grind their own meat wouldn't have a KitchenAid stand mixer. 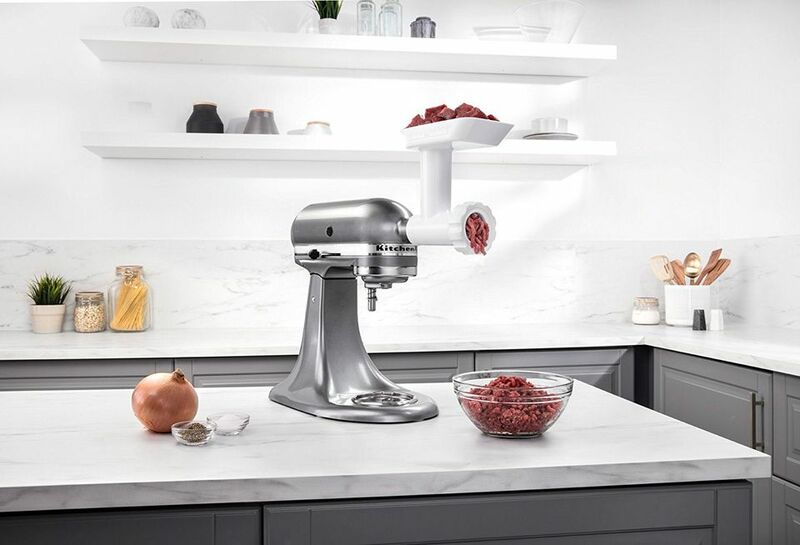 KitchenAid has come out with a metal version of their food grinder, which includes more features such as a larger food tray, a medium grinder plate (along with the fine and coarse), and sausage stuffer tubes. It can also be placed in the refrigerator before using to keep the food you are grinding cold during the process and comes with its own storage case. What is a Food Mill and What is it Used For?